I haven't read this book - I'm featuring it because the title is perfect for today, April 15. 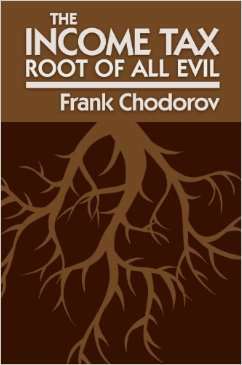 Frank Chodorov was an extraordinary thinker and writer, and hugely influential in the 1950s. In this classic work, he argues that the income tax, more than any other legislative change in American history, made it possible to violate individual rights. He argues that income taxes are different from other forms of taxation because they deny the right of private property and presume government control over all things. The foreword is by former IRS commissioner J. Bracken Lee. I like it already. The reviews on Amazon are positive. I'm really going to have to read this. The Income Tax Amendment, says the author of this powerfully reasoned little book, is contrary to the spirit and the principles of the Constitution of which it is a part. For the Amendment gives to the Federal Government first claim upon the earnings of the individual, and so infringes his natural right to own what he produces. With its graduated-tax provision, the Income Tax Amendment is a replica of that clause in the Communist Manifesto which provides for the confiscation of all property through the use of just such a tax. Not only is the individual citizen's liberty partitioned by the Amendment, but the several states are deprived of their Constitutional sovereignty, and the central Federal Government is overstrengthened at their expense. This growth of centralized power is a development which generations of Americans fought stubbornly to prevent. And the Federal Government, by the very nature of government itself, increases its "needs" in accordance with its means of revenue. Reduce Federal income, argues Frank Chodorov, and Federal "needs" will automatically be reduced. The author takes a forthright stand as he defines the immoral nature of income taxation and the fallacy of using to "level off" society. And finally he outlines what can be done to repeal the Income Tax Amendment, bearing in mind the Federal Government's legitimate need for revenue. I can't believe I stumbled on such a perfect book, not just for today, but for this election season, where we have candidates talking about 95% income tax rates. Hats off to you, Mr. Chodorov, you saw it all coming.